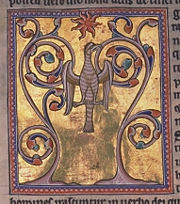 The phoenix from the Aberdeen Bestiary. The phoenix, or phœnix as it is sometimes spelled, has been an enduring mythological symbol for millennia and across vastly different cultures. Despite such varieties of societies and times, the phoenix is consistently characterized as a bird with brightly colored plumage, which, after a long life, dies in a fire of its own making only to rise again from the ashes. From religious and naturalistic symbolism in ancient Egypt, to a secular symbol for armies, communities, and even societies, as well as an often-used literary symbol, this mythical bird's representation of death and rebirth seems to resonate with humankind's aspirations. Although many cultures have their own interpretation of the phoenix, the differences in nuance are overshadowed by the mythical creature's more homogeneous characteristics. The phoenix is always a bird, usually having plumage of colors corresponding to fire: yellow, orange, red, and gold. The most universal characteristic is the bird's ability to resurrect. Living a long life (the exact age can vary from five hundred to over a thousand years), the bird dies in a self-created fire, burning into a pile of ashes, from which a phoenix chick is born, representing a cyclical process of life from death. Because it is reborn from its own death, the phoenix also took on the characteristics of regeneration and immortality. The earliest representation of the phoenix is found in the ancient Egyptian Bennu bird, the name relating to the verb “weben,” meaning “to rise brilliantly,” or “to shine.” Some researchers believe that a now extinct large heron was a possible real life inspiration for the Bennu. However, since the Bennu, like all the other versions of the phoenix, is primarily a symbolic icon, the many mythical sources of the Bennu in ancient Egyptian culture reveal more about the civilization than the existence of a real bird. One version of the myth says that the Bennu bird burst forth from the heart of Osiris. In the more prevalent myths, the Bennu created itself from a fire that was burned on a holy tree in one of the sacred precincts of the temple of Ra. The Bennu was supposed to have rested on a sacred pillar that was known as the benben-stone. At the end of its life-cycle, the phoenix would build itself a nest of cinnamon twigs that it then ignited; both nest and bird burned fiercely and would be reduced to ashes, from which a new, young phoenix arose. The new phoenix embalmed the ashes of the old phoenix in an egg made of myrrh and deposited it in the Egyptian city of Heliopolis ("the city of the sun" in Greek). The Bennu was pictured as a grey, purple, blue, or white heron with a long beak and a two-feathered crest. Occasionally it was depicted as a yellow wagtail, or as an eagle with feathers of red and gold. In rare instances the Bennu was pictured as a man with the head of a heron, wearing a white or blue mummy dress under a transparent long coat. Because of its connection to Egyptian religion, the Bennu was considered the “soul” of the god Atum, Ra, or Osiris, and was sometimes called “He Who Came Into Being by Himself,” “Ascending One,” and “Lord of Jubilees.” These names and the connection with Ra, the sun god, reflected not just the ancient Egyptian belief in a spiritual continuation of life after physical death, but also reflected the natural process of the Nile River's rising and falling, which the Egyptians depended upon for survival. The Bennu also became closely connected to the Egyptian calendar, and the Egyptians kept intricate time measuring devices in the Bennu Temple. The Huma, also known as the "bird of paradise," is a Persian mythological bird, similar to the Egyptian phoenix. It consumes itself in fire every few hundred years, only to rise anew from the ashes. The Huma is considered to be a compassionate bird and its touch is said to bring great fortune. The Huma bird joins both the male and female natures together in one body, each sharing a wing and a leg. It avoids killing for food, rather preferring to feed on carrion. The Persians teach that great blessings come to that person on whom the Huma's shadow falls. The word huma in the Persian language stands for a fabulous bird. There is a belief that if the huma bird sits for a moment on someone's head it is a sign that he will become a king. Its true meaning is that when a person's thoughts evolve so that they break all limitation, he then becomes a king. It is the limitation of language that it can only describe the Most High as something like a king. The Greeks adapted the word bennu and identified it with their own word phoenix 'φοινιξ', meaning the color purple-red or crimson. They and the Romans subsequently pictured the bird more like a peacock or an eagle. According to Greek mythology, the phoenix lived in Arabia next to a well. At dawn, it bathed in the water of the well, and the Greek sun-god Apollo stopped his chariot (the sun) in order to listen to its song. The phoenix (known as Garuda in Sanskrit) is the mystical fire bird which is considered as the chariot of the Hindu god Vishnu. Its reference can be found in the Hindu epic Ramayana. In China, the phoenix is called Feng-huang and symbolizes completeness, incorporating the basic elements of music, colors, nature, as well as the joining of yin and yang. It is a symbol of peace, and represents fire, the sun, justice, obedience, and fidelity. The Feng-huang, unlike the phoenix which dies and is reborn, is truly immortal although it only appears in times of peace and prosperity. In Judaism, the phoenix is known as Milcham or Chol (or Hol): The story of the phoenix begins in the Garden of Eden when Eve fell, tempted by the serpent to eat the forbidden fruit. According to the Midrash Rabbah, upset by her situation and jealous of creatures still innocent, Eve tempted all the other creatures of the garden to do the same. Only the Chol (phoenix) resisted. As a reward, the phoenix was given eternal life, living in peace for a thousand years and then being reborn from an egg to continue to live in peace again, repeating the cycle eternally (Gen. Rabbah 19:5). Rabbi Shlomo Yitzhaki, better known as Rashi, commented that death has no power over the phoenix, "because it did not taste the fruit from the tree of knowledge." The phoenix also appears in the Book of Job: "I shall multiply my days as the Chol, the phoenix" (Job 29:18), again indicating long life if not immortality. This reference, however, is controversial since chol has been translated as phoenix, sand, and palm tree in different versions. The phoenix became a symbol of Christianity in early literature, either from the ancient Hebrew legend or from the incorporation of Greek and Roman culture, or from a combination of both. In any case, the ideology of the phoenix fit perfectly with the story of Christ. The phoenix's resurrection from death as new and pure can be viewed as a metaphor for Christ's resurrection, central to Christian belief. The phoenix is referenced by the early Christian Apostolic Father Clement in The First Epistle of Clement to the Corinthians. 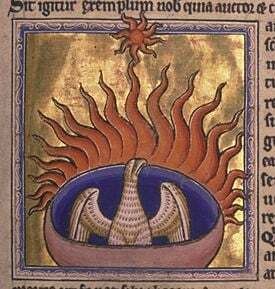 Most of the Christian-based phoenix symbolism appears within works of literature, especially in Medieval and Renaissance Christian literature that combined classical and regional myth and folklore with more mainstream doctrine. 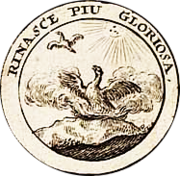 Rinasce piu gloriosa ("It rises again more glorious"). The phoenix does not appear as a heraldic figure as often as other mythical creatures. However, it has appeared on family crests and shields throughout time, usually depicted as an eagle surrounded, but not hurt, by flames. Jane Seymour's heraldic badge includes a phoenix rising from a castle, between two red and white Tudor roses. Some cities in Europe use the phoenix in their municipal emblem to denote the one-time destruction and consequent rebuilding of the city, connecting to the image of resurrection inherent in the phoenix. Phoenix, Arizona was named such because it was a frontier station settled upon the ruins of a Native American site. The first European inhabitants decided to name their city in concurrence with the idea that from the ruins of one city, another was created. A reborn Phoenix, rising from its ashes. The phoenix no longer appears significantly in any religious or cultural truths. However, the image is still used in literature, perhaps because of all the mythical creatures from antiquity, the phoenix is the one that frequently expresses an enduring sense of hope and redemption. Its beauty is not as otherworldly as most of the other creatures in myth, and its symbolism is conveyed with a profound subtlety when used in literature. William Shakespeare made one of the most prominent references in both his plays The Tempest, incorporating a number of other mythical creatures but placing the phoenix separate and above the rest, and in Timon of Athens, when a senator metaphorically calls Timon "a naked gull, which flashes now a phoenix." In other works of Renaissance literature, the phoenix is said to have been eaten as the rarest of dishes—for only one was alive at any one time. Ben Jonson, in Volpone (1605) writes: "could we get the phœnix, though nature lost her kind, shee were our dish." Sylvia Townsend Warner's 1940 short story "The Phoenix" satirized the exploitation of nature using a phoenix maltreated in a carnival sideshow, revealing the modern preference for violence and sensationalism over beauty and dignity. The majesty of Eudora Welty's classic 1941 short story “A Worn Path” employs the phoenix as the name of the major and virtually sole character of a sparsely written, yet rich story of regeneration and the South. Edith Nesbit's famous children's novel, The Phoenix and the Carpet is based on this legendary creature and its quirky friendship with a family of children. The phoenix was also famed for being a symbol of the rise and fall of society in Ray Bradbury's Fahrenheit 451. The pattern of an over complacent and abusive society's destruction yielding a fresh new start was compared to the phoenix's mythological pattern of consumption by flame, then resurrection out of ashes. Sylvia Plath also alludes to the phoenix in the end of her famous poem Lady Lazarus. The speaker of this poem describes her unsuccessful attempts at committing suicide not as failures, but as successful resurrections, like those described in the tales of the biblical character Lazarus and the phoenix. By the end of the poem, the speaker has transformed into a fire bird, effectively marking her rebirth, which some critics liken to a demonic transformation. The poem ends: "Out of the ash / I rise with my red hair / And I eat men like air." More recently, Harry Potter series author J.K. Rowlings has used a phoenix as a central symbol in her stories. While the Harry Potter series has drawn some controversy from the Christian community, Rowling's use of other classical mythical beasts and her classical literature background suggests that she is using the phoenix as a Christian symbol of purification and resurrection. ↑ Naosherwan Anzar (transl. ), The Master Sings, Meher Baba's Ghazals (Zeno Publishing Services, 1981). On-line edition, May 28, 1995. Retrieved May 13, 2011. ↑ Kahn, Hazrat Inayat, The Music of Life (Omega Publications, 1998, ISBN 978-0930872380). ↑ Mark Schumacher, Phoenix www.onmarkproductions.com. Retrieved May 13, 2011. ↑ Legends of the Phoenix: A Basis in Biblical History Countdown to the Messiah. Retrieved May 13, 2011. ↑ George Sajo, Phoenix on the top of the palm tree: Multiple interpretations of Job 29:18 Silva de varia leccion, Studiolum, 8-2-2005. Retrieved May 13, 2011. ↑ Tudor Heraldic Badges Coats of Arms & Their Meanings The Tudors wiki. Retrieved April 29, 2015. ↑ John Granger, Looking for God in Harry Potter (Saltriver, 2006, ISBN 1414306342). All links retrieved March 25, 2019. This page was last modified on 25 March 2019, at 20:23.